The first edition of this dictionary having been exhausted, it has been extensively revised, and certain new features and alterations have been introduced into it. 1. The principle of arranging all words according to their actual spelling has been to a considerable extent abandoned. It was admittedly an unscientific one, and opened the door to a good many errors and inconsistencies. The head form in this edition may be either a normalised form or one which actually occurs. 2. Words beginning with ge- have been distributed among the letters of the alphabet which follow that prefix, and the sign + has been employed instead of ge- in order to make the break in alphabetical continuity as little apparent to the eye as possible. The sign ± has been used where a word occurs both with and without the prefix. 3. References to Cook’s translation of Sievers’ Anglo-Saxon Grammar, and to the Grammatical Introduction to Sweet’s Reader have been taken out, as Wright’s or Wyatt’s Old English Grammar will have taken their place with most English students. 4. A new feature which, it is hoped, will prove widely useful, is the introduction of references to all, or nearly all, the headings in the New English Dictionary under which quotations from Anglo-Saxon texts are to be found. A vast mass of valuable information as to the etymology, meaning and occurrence of Old English words is contained in that Dictionary, but is to a very large extent overlooked because it is to be found under the head of words which are now obsolete, so that unless one happens to know what was the last form which they had in Middle English, one does not know how to get at it. 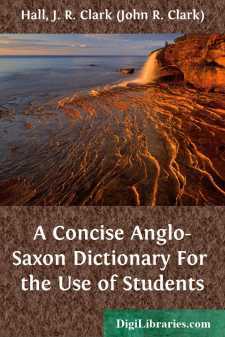 This information will be made readily available by the references in the present work, which will form a practically complete index to the Anglo-Saxon material in the larger dictionary and will at the same time put the student on the track of interesting Middle English examples of the use of Old English words. Besides directing the reader (by means of quotation marks) to the heading in the New English Dictionary where the relevant matter may be found, an indication has been given of the texts from which quotations are made therein, when these do not exceed four or five. 5. There have been many valuable contributions to Anglo-Saxon lexicography (by Napier, Swaen, Schlütter, Förster, Wülfing and others) since the first edition of this Dictionary appeared, and these have been made use of, but (as before) unglossaried matter has not been systematically searched for words not hitherto recorded in Anglo-Saxon Dictionaries.